School is finally out for Christmas break. It feels like forever since I've sat to do review a book, and as I here here at 11:12 PM, I'm thinking to myself that I am really too tired to do this. But I shall push through because I loved this book, and it's a perfect read leading up to Christmas (which is less than a week away now might I add). First of all, how cool is it to look at the cover and see all of the YA names we love? 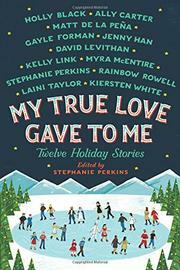 From Gayle Forman (If I Stay series) to Matt de la Pena (The Living) this holiday book has every perspective possible, and it's edited by international bestselling author Stephanie Perkins (Isla and the Happily Ever After). While you could read this book anytime during the year, it's especially wonderful during the holidays, and the stories represent all aspects of the holiday season, including Christmas, Hanukkah, Winter Solstice, and New Year's, so there's definitely a voice for any reader. What I wish I would have done is read one story a day leading up to Christmas, but I couldn't put it down, so I finished it too quickly. Not a bad thing, right? My favorite of the twelve stories is probably Pena's "Angel's in the Snow" because of the diverse cultures represented. Set in Brooklyn, the story follows a Latino college student named Shy who is catsitting in his boss's apartment, only his boss didn't leave enough food in the fridge, and Shy is very close to starving, literally. Haley, a cute tenant in the apartment building, knocks on Shy's door looking for Mike, Shy's boss, to help her with her plumbing, also literally. So begins a flirtatious tale of not being home for the holidays, of barely making it on scraps, and of the hesitation to ask for help. Whether you read one of the stories by your favorite author or you read the entire book as a collection, there's something here for you to enjoy. So sit back next to your Christmas tree or your Menorah and fall in love with some pretty awesome tales.